When I’m under the weather, very few things appeal to me more than some good ol’ comfort food. You know, the kind of indulgent food that you grew up eating that really warms the soul. Having been sick all last week and still in recovery mode this week, I decided that only meatloaf would make me feel better! 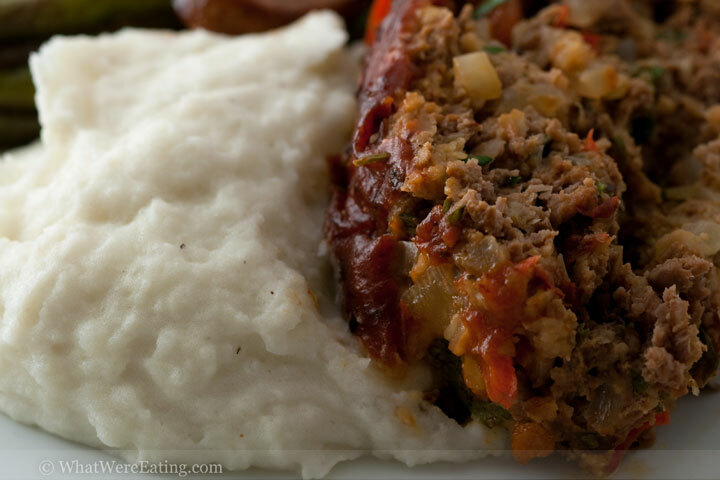 My meatloaf was mixed with sauteed fennel, red peppers, onions & garlic and fresh herbs then topped with a spicy chipotle glaze then served with buttery mashed potatoes. Growing up, my dad was always the cook in the family. My mom baked for Christmas and occasionally other holidays but never cooked. Let’s amend that – still never cooks. To this day, I believe she might use her oven as excess storage space rather than a cooking appliance and I would put money on there being canned goods in the cupboards that I purchased when I was in high school! The one savory dish that my mom would make throughout my childhood was her meatloaf, which I absolutely loved. It was just a basic ketchup topped, well-seasoned ground beef meatloaf, but my god, I loved it! (And loved the meatloaf sandwiches on white bread w/ yellow mustard that followed.) Now, while my version of meatloaf isn’t exactly what my mom used to make, I still think of her and her version whenever I go to make one. And yes, I still use a ketchup based topping! This one’s for you mom! For always being there for us and providing for us whether we were under-the-weather or just under-your-skin, if not in the kitchen, then in every other aspect of our lives. We wouldn’t have grown up into the kickass people we are (imho) without you playing such a fundamental role in our lives! I love you! Preheat oven to 350 degrees. Place rack in upper 1/3 of oven. Place a large saute pan over medium heat. Add canola oil to the pan and allow the oil and pan to preheat. Once the pan is hot (about 2-3 minutes), add the diced onions, fennel, and red pepper. Season with a pinch of kosher salt and freshly cracked black pepper. Saute over medium heat for 10-15 minutes, stirring occasionally, until onions are completely translucent and fennel is soft. Remove from heat and allow veggies to cool slightly, 1-2 minutes. While the veggies are cooling, prepare the topping. Add all ingredients for the topping into a small mixing bowl. Whisk to combine thoroughly. Place the fresh bread crumbs into a large mixing bowl. Add whole milk and stir. Once the bread crumbs have absorbed all of the milk, add the sauteed veggies to the bowl. Add the rest of the ingredients for the loaf into the mixing bowl. Using your hands, thoroughly mix all of the ingredients into the ground beef. Pour the mixture out onto a sheet pan. Form the meat into a long loaf about 3 to 4 inches tall and 4 to 5 inches wide. Once the loaf has taken shape, pour the topping down the center of the top of the loaf, lengthwise. Using the back of a spoon, evenly spread the mixture over the top allowing a small amount of the topping to slightly drizzle down the sides. Place meatloaf into a preheated 350 degree oven on the rack in the upper 1/3. Bake at 350 for 50-60 minutes until the loaf has cooked through and the topping has begun to caramelize. Remove from oven and let rest for 5 minutes before slicing and serving. Enjoy! As we used to say when I was a kid….. You guys truly ROCK! Here, here! I was seriously debating on making my own meatloaf yesterday, but ended up with a pot of red sauce and spaghetti. Meatloaf has to be the only food that could possible taste better the day AFTER you make it, especially on a leftover sandwich! Great story about your mom–and I’m digging the chipotle twist. Yep, this would definitely make me feel better! Such a yummy twist on a traditional meal, I like it. I’d love to make a sandwich with the leftovers the next day, too :)! This looks delicious, I’ll have to try. This is exactly what I’m looking for! I love chipotle and I love meatloaf! Can’t wait to try this out. I swear to you I can smell that meatloaf from here. No really. what’s not to love about meatloaf? this looks amazing.